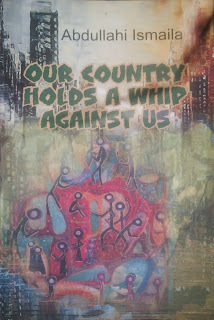 Abdullahi Ismaila’s new poetry volume, Our Country Holds A Whip Against Us is a requiem for a lost country, Nigeria. This anthropomorphic collection is a dirge that re-enacts the depravity of social justice, maladministration and the trivialization of humanity by the political class who hold the masses in contempt; the same people who elect them into power under the tiring slaps of the sun. The country has turned its back on the people and in consequence they no longer consider her home because she no longer holds promises of a brighter future. The title therefore captures the decay of a country at war with itself and encapsulates the dysfunctional state of the system of things and the hopelessness that hovers above the land. And perhaps the country’s symbolic holding of the whip represents the current administration with its high handedness and intent of beating sanity into the public’s consciousness. This collection in its every breath is reminiscent of Osundare’s ideological pontification on the functionality of poetry as reflected in his phenomenal Meta poem “Poetry is” in which he sets the precepts of what should constitute a poem that bears true allegiance to society. In this volume, unlike in the poet’s previous works, the poet’s commitment to the state and its social concern is akin to the socialists’ renditions of the second generation poets. Poetry’s capacity to function, uplift the spirit, to unravel the innate mysteries and x-rays man’s clever-folly is brought to bear in this volume. Ismaila emerges in this collection as a sage that ingenious poets are: the sublimity of his rendition, effortless diction, philosophy, lyricism and language is aesthetically phenomenal. Poetry in this collection achieves artistic depth and meaning. The poet show that poetry could be used as a means of social engagement with the state, her actors and still retain its artistry, elegant erudition and metaphorical ingenuity. The volume is an elongated poem in three parts with subtitles including “Season of Baleful Banalities,” “Season of Toneful Wailing” and “Season of Wakeful Laughter's” and a glossary explaining unfamiliar words and phrases. The sixty page collection is so slim that it passes for a pocket book; it is light and easy to carry about. It slimness however is not a true reflection of the philosophical depth and conscientious pontification on the ugly state of affairs of the country metallically x-rayed. This is a poetry collection that speaks for the ordinary folks caught between the quagmire of living and dying in a country that no longer belongs to them but has become an expansive prison in which the majority are chaperoned by a minority group of wardens who hold the whip. In the opening stanza, the persona announces the travails of the land and who the victims certainly are where he asserts: “Our country holds a whip/Against us, drawing rivers of blood/Drawing ocean of tears/Damning our throats with hemlock” (10). In what appears like an epic narration, the persona takes a journey through the various facets of life as he bewails the rust and loss of humanity’s essence of being, painting a gory picture of the ugliness that has befallen the country. For example in this stanza the persona declares; “This is a season of baleful banalities,/Of sorrows weaned/On bileful narratives” (11). In a paradoxical depiction of the state of despair in the land the persona draws a profound analogy using the hen to symbolize the helpless and hopelessness of the masses even in the face of evident surplus yields. He enthuses, “Of the seething sadness/Of the hen which watches/the corn in sealed bottle;” (12). If the yields of the land are unattainable by the poor then the poor are like the hen that will never be able to access “the corn in sealed bottle”, for this is the fate of ordinary Nigerians whose communal wealth is embezzled and stocked in unreachable saves in foreign lands and at home as well through professionally orchestrated corruption. In the second part; Season of Toneful Wailing the persona takes a derisive swipe at the events that both preceded and heralded the President Jonathan’s administration. The persona mocks the events of this era as well as the role played by some intellectuals in the politicking that led to the emergence of President Buhari’s Administration and the hysteria that trailed President Buhari’s ascension of office as the president. This diatribe is particularly targeted at the opposition describing their grievances as “toneful wails.” The persona ridicules the position of the opposition who bemoans the economic hardship ushered in by the Buhari administration, although for the persona this hard time holds much promises of indecipherable bliss. He enthuses, “In this wailing season/Throats are slit that hold/Promises of symphonies of laughters,/Nymphets with wombs of new moon/Are chiboked to wild fantasies” (38). The last stanza of the second part summarizes the import of the section thus, “In this season/Of festive goats/Of feasting wastrels/Greed is adopted by lies/In the vault of padded dreams” (44). The third part, Season of Wakeful Laughters is a celebration of victory at last, of restored hope and elation and joy. Here, the persona becomes embolden to the possibility of laughter and brighter days which he celebrates in high spirit, he assures that “Laughter will return/To our clammy cavities/To be laughed soulfully” (46). And reasserts the certainty of final hour of glory in this stanza, “This is the hour/Of the laughter we waited for/With trepidation;/Of the light we labored/To see at the end of the tunnel;/The wakeful moment of our choosing,/Of our redeeming laughter;” (52). This is clearly appears like a contradictory allusion to Osundare’s waiting laughters. The volume comes through with much newness that smacks of years of tireless toiling and pruning by the poet. The musicality of the lines, doses of philosophical pontification, rhetoric, diction and experiment with style in the third part, use of native words, imagery, metaphor ad unusal collocation such as “Are chiboked to wild fantasies” add to the uniqueness of the collection. However, as it is with socially inclined works, sometimes the lines come through as watery and in some instances blatant clichés are woven into the body of otherwise elegant lines. The poet’s capturing of the realities of our times could be likened to the subjective banters of partisanship. For example, the poet mocks the Jonathan era including his political philosophies and party, he even mimic’s Patience Jonathan’s dramaturgy and whereas the APC led administration of Buhari is portrayed as the saving grace of the nation, even though the functionality of the current administration is highly contestable. The evidences are quite glaring and more prominent in the second part of the collection. A half told truth is half a lie because it captures just a single side of the story but that is what poetry is, a personal reflection and recollection of feelings and events by the poet. But, a poet that dares to speak for the society must do so altruistically. Above all though, this is perhaps one of the most ambitious collections of poetry in recent times to have emerged with a clearly defined sense of responsibility and a philosophical agenda. It is a work worth having by any lover of beautiful poetry.